Mischief means playfulness behaviors that is intended to tease and/or create trouble. I know many bloggie friends that enjoy playful behaviors and I’m one of them. Every Monday, we get together on a blog hop and share our Mischievous behaviors. had an idea … a Mischief BOOK. They finally finished it. but surprisingly includes two cats and a turtle. Mischievous behaviors are re-told in 20 Amusing Rules that Snoopy and her mom formulated. These rules are not just ordinary rules, but are very helpful to be a Mischief Master. I’m in the book, Rule #19 : Ever Considered It Could Be A Co-incidence? Hilarious and had lots of Golden Laughs. It’s a guarantee that will bring laughter to you too. An added bonus is to be able to read Snoopy’s tidbits of mischievousness on each of the rules. 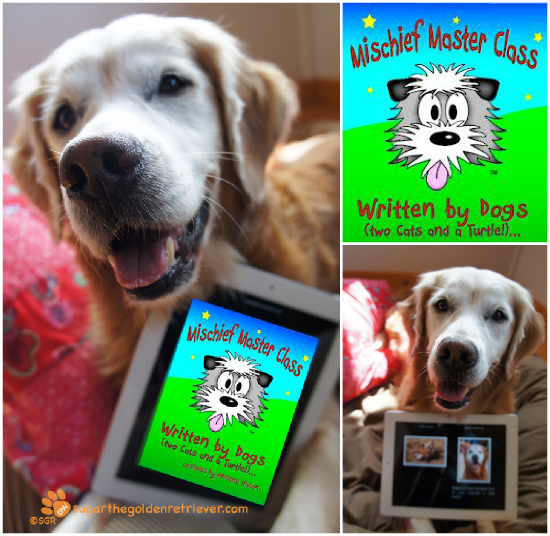 Mischief Master Class is a must read, 4 Golden PAWS! It’s available in Amazon as an e-book. 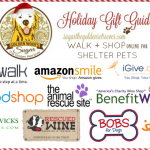 50% of the book profits will help and support the Therapy Pet Charities. Many Golden Thanks to Snoopy and especially to his mom Annette for creating this book. Oh, that sounds like a really good read! We will have to check it out! Sounds good. We’ll check it out! Mom showed me a sneak peak during her editing process and we both had a giggle as we read your submission. So glad you enjoyed the book; Snoopy and Miss Annette have such talent, don’t they? We hope lots and lots of humans purchase the book to help therapy dogs!!! That sounds like a super book and one I must read. I’ll be turning to rule #19 first. Thanks for telling us about this fun book. Lightning is the Master of Mischief here. If my mom was still working as a School Librarian… she would order a bunch of these. I’ll bet KIDS would Love them. Oh Sugar, that really sounds like a great book! Only made betters with your Lovely face! 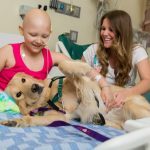 I loves that some of the proceeds go to such a great cause!! That sounds like an important reference book for us young pups! That sounds like my kind of book! Thanks for sharing, Sugar! I will for sure be buying this! 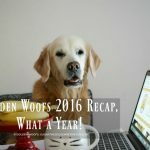 My three favorite things: Dog stories, Mischief, and Helping Therapy Dogs!! How awesome! HaHaMeow! We like the sound of this book, we’ll check it out. Happy Caturday! Oh Sugar this book is THE MUST HAVE for me – Thanks!!! I’m SO happy you enjoyed the book buddy!! Thank you so much for your review – you are just the sweetest!! I loved that you got to ‘help’ your Mom read the book – I hope you got a few new Mischief ideas?! Wow this sounds like a great book. Maybe it will give me some new ideas! Congrats to Annette on the book. I like how she took the stories submitted and used them as examples of rules she made up from them. Sounds like a fun book. We are going to check it out. Have a super Saturday. Sounds like a great read! As you know, mischief should have been my middle name. Sounds like a great book…but I won’t tell Dakota the Corgi – she’s about 98% a very good girl and I don’t want her getting any ideas! We are so excited to get copies of the book for Christmas presents. Can’t wait to read it. My Vickie doesnt have a kindle so we are waiting for the printed version. i like your book recommendation cuz i am all about the mischieviosities! teeheehee, i’ll have to get my mama to help me read it over christmas breakies cuz she isn’t gonna be much funsies until her finals are over! Isn’t if fun to learn more about mischief and be in the book too?